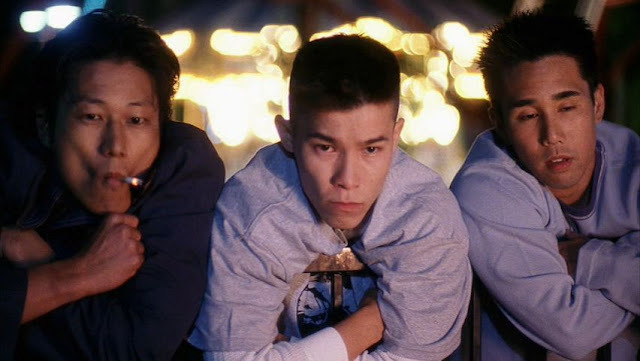 Better Luck Tomorrow (2002) is a truly excellent film about the second generation, young, Asian male's experience in North America. Co-written and directed by American-Taiwanese director Justin Lin before he started doing wildly mediocre studio fare like Annnapolis, The Fast and the Furious: Tokyo Drift and its follow-up, Fast & Furious. The on and off screen talent here is primarily Southeast Asian. This is a rare feat and unsurprisingly, a result of an independent production funded by credit cards and MC Hammer. Better Luck Tomorrow surprised many, especially when it was picked up by a major studio, Paramount Pictures under its MTV Films banner in 2002. The protaganist and his friends resort to a life of crime and violence because they are simply bored with their lives on the horizon of going off to college. Better Luck Tomorrow even touches upon, albeit very briefly, on what I feel is the de-sexualization of the modern Asian male in society. I also love the fact that there are almost no adults in the film. Also, I just love John Cho (Harold & Kumar Go to White Castle, Star Trek). He has a meaty role as a (very old-looking) soon-to-be high school grad who feels he and his family need a shock to their systems. He has some choice lines. His character believes as an Asian, if you have time to be happy, you're not working hard enough. So typical, you can never enjoy your success, because you're so busy working hard for more and more success. This film was a remarkable and auspicious breakout hit, shot amateur-style on a shoestring budget. Its acting, direction, themes and subtext offer a lot on the Asian-American experience. I highly reccomend it.